When I first began my real estate career (in 1991), I was selling residential lots and homes for Killearn Properties. I observed that there appeared to be an accepted ratio between the price of the land and the eventual value of the property once a home had been built. Over the past 24 years, I have seen that ratio move around a bit. When developed lots are scarce, the ratio rises (meaning the value of the land is a greater part of the whole package price), whereas a market with a glut of lots resulted in a fallen ratio. So, using the two ratios that I have observed over time, you can quickly determine the value of the land in a developed neighborhood which still has a few vacant lots remaining to be sold. Just as with every other asset, supply and demand will determine what buyers are willing to pay in any given market. In the real estate graph above, the green vertical columns show the one-year trend of the average number of lots selling each month (measured on the left vertical axis), while the brown line shows the one-year trend of the average lot price each month (measured on the right vertical axis). 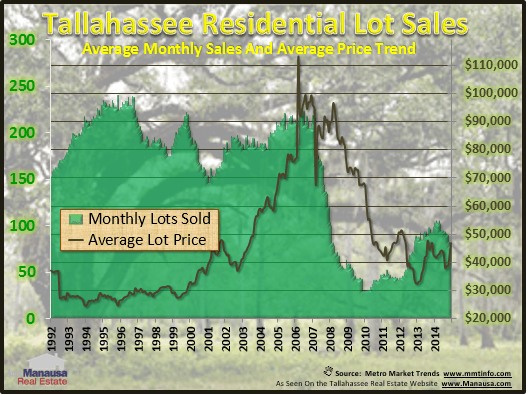 Currently, the average lot price has risen to $47,000 and Tallahassee has averaged 78 lot sales per month over the past year. NOTE: If you don't happen to subscribe to the Tallahassee Real Estate Newsletter, you might want to check out this morning's one-page special report. 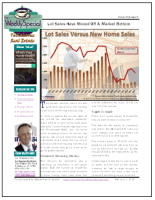 It shows the relationship between lot sales and new construction sales over time, and you can get it right here. While this is a rule of thumb that might or might not be practical in every area, I know that it will serve most people well in the Tallahassee real estate market. The only times that it won't be useful is when you are looking at large acreage (meaning the land holds more value than the house built upon it). The rule of thumb: Land is typically 25% to 33% of the property value. Let's say you own a lot in a Tallahassee neighborhood where recent home sales have been from $350,000 to $400,000. Applying the rule of thumb, you could conclude that your lot would sell in a range from (25% of $350,000 to 33% of $400,000), meaning a range in value from $87,500 to $132,000. Then you would look at current market conditions, and in Tallahassee, it is still a buyer's market. That means you should expect to sell your lot nearer the lower end of the range. You would then look at supply and demand for lots in the $80,000 to $100,000 range to see the depth of your competition. The majority of lot buyers are likely to finance the construction of their home. When it comes time to put a house on the property, the valuation for the new construction will not appraise if the buyer "over-pays" for the land. In our scenario above, assuming a new construction price of $150 per square foot, the buyer paying $132,000 for the land could only build a 1,787 square foot home (very small for a $400,000 home), while the buyer who paid $87,500 could build a 2,083 square foot house (still relatively small for a $400,000 home). The buyer paying the lower price would end up with 17% more house than the one who paid the top price. Since there are plenty of lots available at this price range, prudent buyers are going to shop for bargains so they can build more house. If you are thinking about building a house, I recommend you start by meeting with a well-trained real estate buyer's agent. Because you will be paying a premium for new construction, I would also recommend that you first rule-out all existing homes, as they will be a better value. But if you are still wanting to build, start by choosing where you want to live and select a lot that will allow you to build the home of your dreams. If you'd like to know more about lots and land in Tallahassee, just drop me a note and we'll be in touch as soon as possible.